Delhi, Hong Kong and Singapore – Raffles Delhi, Raffles Hong Kong and Raffles Singapore were proud to host giant fashion group Inditex, owner of international fashion-forward brands like ZARA, Pull & Bear,Massimo Dutti and Bershka, during their campus visits. 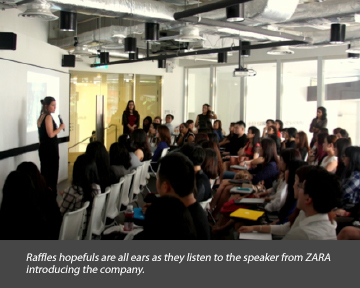 The company came to Raffles campuses in hopes of finding fresh blood for their international internships and their ZARA GO! programme. The latter offers candidates an opportunity to work at the headquarters of Inditex in Galicia, Spain for one year to master the operations of the company. Upon completion of their training, candidates can work in an Asian country of their choice. 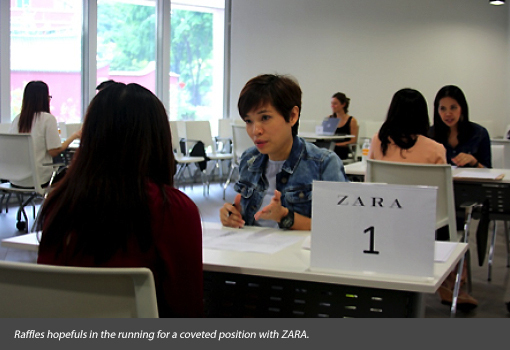 The international interviewing panel from Inditex was led by Human Resources Director of ZARA India Ms. Betty Catharine Hygrell, Human Resources Manager Ms. Manvi Burman, Mr. Jose Luis, recruitment team of ZARA China, and Ms Christina Velesco Diez from Human Resources Asia. the industry of their dreams that was not to be missed. Zara’s visit to our college has been an enriching experience, as we got to learn about how the brand and industry works in great detail,” said Garima Singh, a student of Fashion Marketing and Management. “It has been really helpful for me in my area of study, as I now know the different roles and tasks of people in the various job fields in such a brand. We got a chance to interact and learn from them, as well as the chance to submit our CVs to them which is a big opp ortunity for all of us. 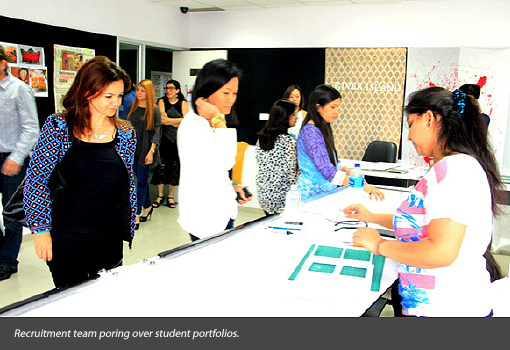 Raffles Creative Practitioners were similarly appreciative of the educational experience that their students got. Maria Cuadrado, who teaches Fashion Marketing. Raffles thanks Inditex for their visit, and wishes all hopeful candidates the best of luck.